If you’re in the market for a more efficient HVAC system, no doubt you’ve learned already about efficiency ratings. The Department of Energy issues these ratings for air conditioners, furnaces, boilers, heat pumps and other HVAC equipment so consumers will know how the various brands and models stack up against each other in terms of efficient fuel consumption. Saving fuel not only lowers your utility bill, but also reduces the carbon footprint for your household. Your HVAC consultant will be happy to explain what SEER, HSPF and AFUE mean.But your consultant should also explain under what conditions you can expect to realize the efficiency rating that is printed on the product tag of the equipment you choose. Here’s a rundown on HVAC efficiency ratings. SEER, or the seasonal energy efficiency ratio, measures air conditioner or heat pump efficiency, or how much energy it takes to reach a set point for cooling. The minimum SEER allowed to manufacture is now 13, but equipment made prior to 2006 has a much lower SEER. Manufacturers of the most efficient equipment have achieved a SEER of 20 and higher. HSPF, or heating seasonal performance factor, measures the efficiency of air source heat pumps when they are in heating mode. AFUE, or annual fuel utilization efficiency, measures how efficiently a furnace, boiler or water heater is when it converts fuel to energy over a heating season. The higher the AFUE, the more efficient the equipment. For instance, an AFUE of 90 percent means 90 percent of the fuel consumed is converted to energy. The minimum standard is 78 percent for gas-burning furnaces, but will be going up for newly manufactured equipment. 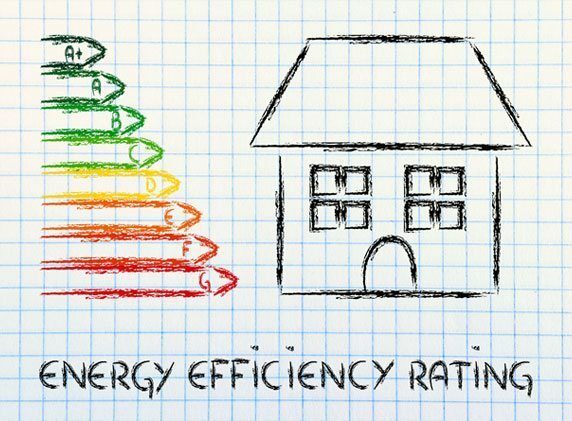 Homeowners looking to upgrade to more efficient equipment should be aware that achieving the efficiency rating that is printed on the product label depends on several factors. AHRI certification. The best way to achieve maximum efficiency is by buying a system that is certified by the Air Conditioning, Heating and Refrigeration Institute. AHRI certification verifies that the parts of your system — the condenser/compressor, the furnace and the evaporator — are matched and if correctly installed, will achieve the efficiency level on the product tag. Quality installation. The quality of the HVAC installation is key. Unless a system is installed correctly, it will not achieve the promised efficiency rating. That’s why hiring a scrupulous dealer whose technicians are trained in installing a top brand is important. Without that specialized knowledge, the efficient results won’t be there. Correct sizing. Knowledgeable consultants also know they must size the equipment correctly to get best results. That means using industry software fed with data compiled during a home consultation, including square footage, R-value of insulation, number and size of windows, number of the home’s occupants, the house’s directional orientation and other factors, to determine correct heating and cooling loads. Using a rule of thumb that calculates from square footage alone will probably result in equipment that’s too large, which will short cycle and run inefficiently, or equipment that’s too small, which will struggle to do the job. Matching equipment. Then there’s the issue of matching the “sides” of the system. Most HVAC systems installed in residences are split systems, with an outdoor compressor and condenser, and an indoor furnace, air handler and evaporator coils. The various components have to work together in sync and be matched in efficiency to achieve the ideal efficiency printed on the tag. For instance, if you have an older furnace that uses a one-stage blower, you won’t be able to maximize SEER when you buy a two-stage or variable-speed A/C. Your choices will be limited unless you replace the furnace and the blower to match the A/C. The unfortunate fact is, more than 80 percent of all HVAC systems are not installed correctly and that always affects performance. One way to verify proper installation is through a combustion test. Few contractors own the expensive equipment required to perform this test, so very few actually can verify that their installations are achieving the efficiency ratings on the product tag. To sum it up, a lot of dazzling new technology has been developed that makes HVAC equipment more efficient than ever, from two-stage and variable-speed air handlers, to two-stage and modulating furnaces and compressors. But to get the most out of these innovations, the consultant must have the knowledge and skills to match, install and test the equipment properly. For more on understanding energy efficiency ratings, contact Air Authority of Mason. Our Greater Cincinnati customers always come first.